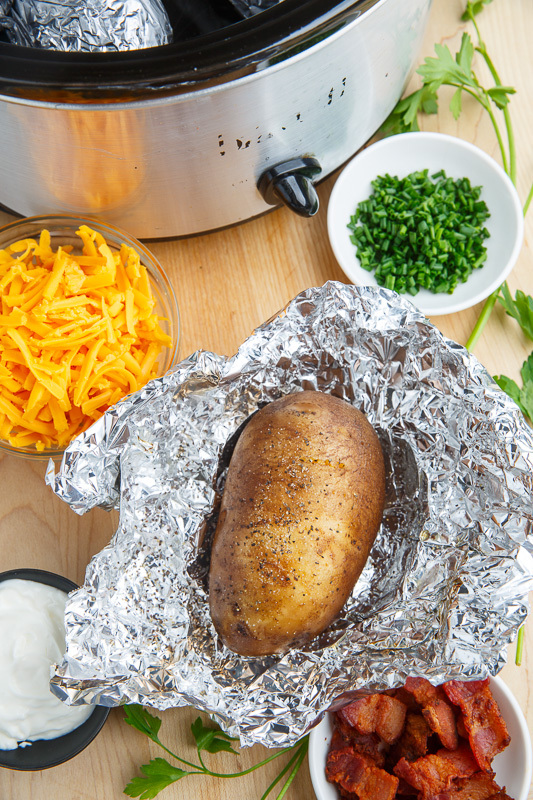 Quick and super easy slow cooker baked potatoes that are perfect every time! 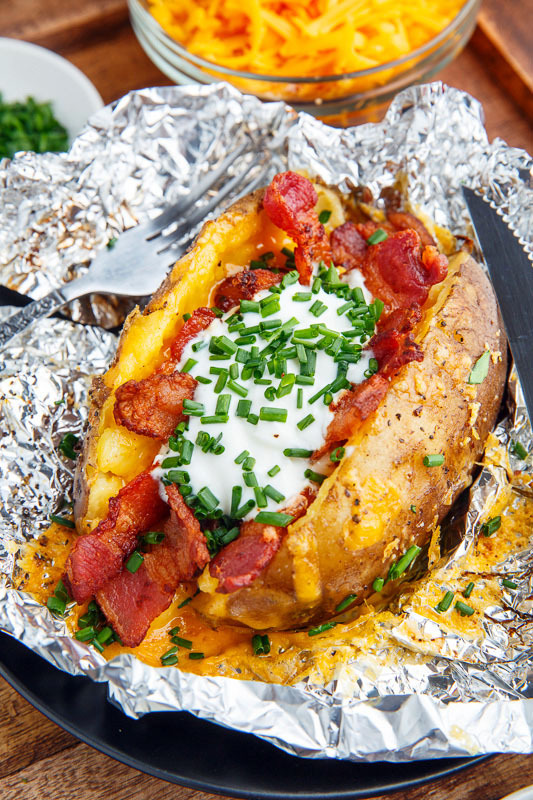 Today I have some baked potatoes for you, but not regular baked potatoes, super easy, no mess slow cooker baked potatoes. Baked potatoes are pretty easy to make in the oven but sometimes you don’t have access to an oven or your oven is too full of other things, or you just don’t want to have your oven on and the slow cooker is the perfect alternative way of baking them. You pretty much just need to scrub the potatoes, add a bit of oil, salt and pepper, wrap in foil and cook in the slow cooker! 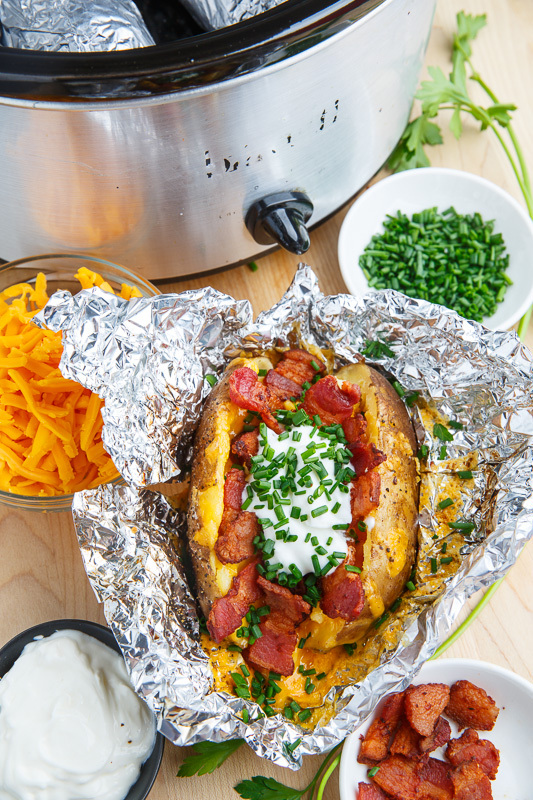 That’s less than 5 minutes of effort and some no attention required slow cooker time and you have great baked potatoes every time! I like to make a meal out of them by topping them with cheddar cheese, sour cream, bacon and chives! 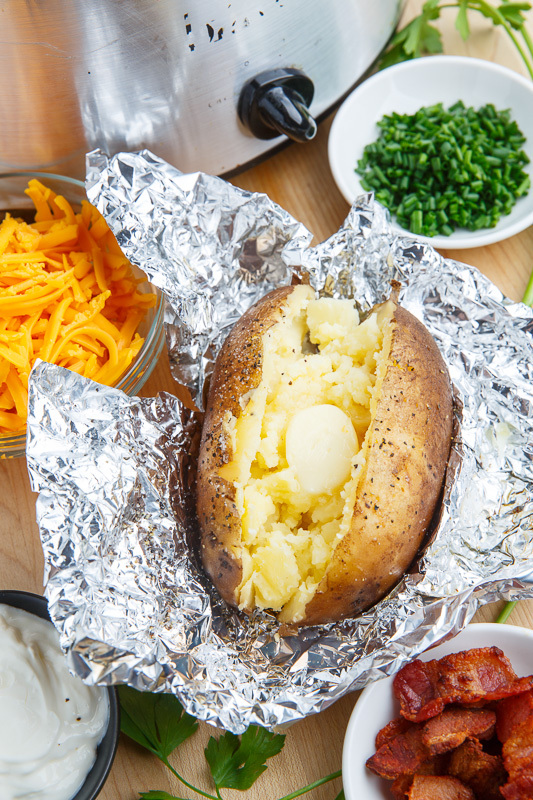 Rub the potatoes with the oil, salt and pepper, wrap in foil and cook in the slow cooker for 8-10 hours on LOW or 4-5 hours on HIGH before unwrapping, slicing and sprinkling with toppings! 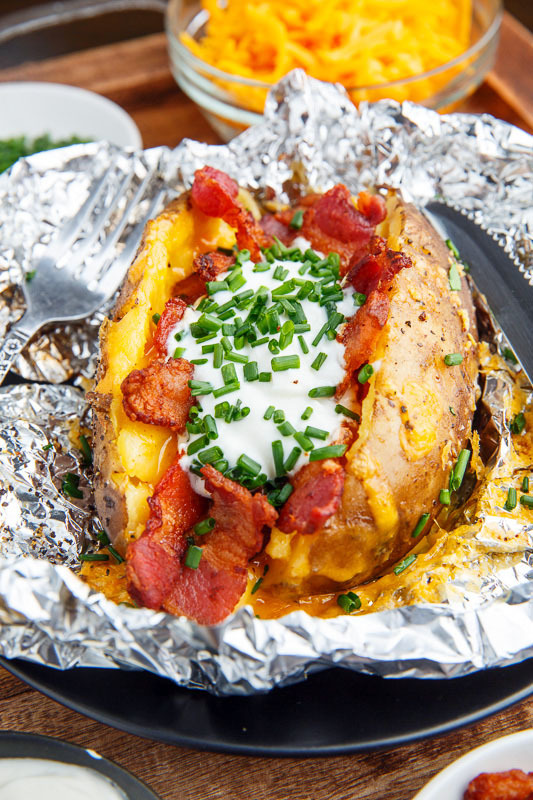 Option: Top with your favourite baked potato toppings! Other than the length of cooking time, I fail to see how slow cooker baked potatoes are any "easier" than those cooked in an oven. The prep time is the same, and you still have to check the potatoes' level of doneness, so there's the same time commitment and the start and end of the cooking process. 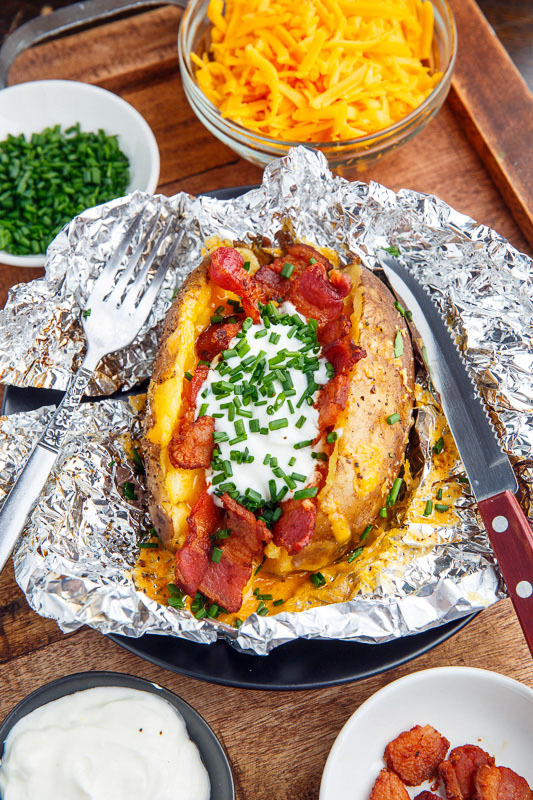 Oooh I've been trying to be a better slow cooker user this year and this looks like a fun recipe to try :)Baked potatoes ready to go when I get home from work! Hot potato! Does this look good! I have been baking potatoes this way for several years. I also enjoy baking sweet potatoes in my slow cooker. Great recipe, Kevin. I have tried several of your recipes. Thanks. What a great idea to use the slow cooker! Hi. When I do potatoes this way they go quite brown on the insides. Is this normal? Your potato looks a normal colour. This is seriously one of my faves!